Stingray Point (Replica)* – Chesapeake Chapter U.S.L.H.S. 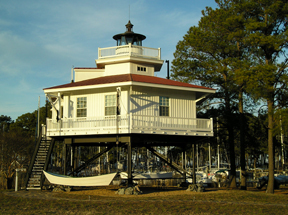 Stingray Point Lighthouse was built in 1858 at the entrance to the Rappahannock River near Deltaville, Virginia. It was a hexagonal screwpile lighthouse. The lighthouse was automated just prior to being dismantled in 1965. Sections of the lighthouse were sold to Gilbert Purcell, a boatyard owner who hoped to rebuild the lighthouse on land, but never did. It was replaced with a steel skeletal tower built on the original foundation. A Stingray Point replica was completed in March 2003 at Stingray Harbor Marina.